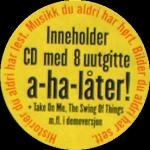 A book on a-ha's career (The Swing Of Things) by Jan Omdahl was released in Norway on 21st October 2004. It is written in Norwegian and tells the story of the last 20 years of a-ha and features new pictures and stories never before been told in nearly 400 pages. The cover of the book is black with a picture of three monkies, one with hands on his eyes, one with hands on mouth and one with hands on ears (depiciting the saying "See no evil, Speak no evil, Hear no evil"). One of each of the letters spelling "AHA" are written on the bellies of the monkies. The title of the book is printed in white above. A yellow sticker on the front of the book reads "Inneholder CD med 8 uutgitte a-ha-låter! Take On Me The Swing Of Things m.fl.i demoversjon" with "Historier du aldri har lest. Musikk du aldri har hørt. Bilder du aldri har sett." (The stories you have never read. The pictures you have never seen.) printed in orange around the outside. The book includes a unique CD "The Demo Tapes" with 12 early recordings by the band which have never before been released. The tracks include demos and early versions of released tracks plus an "extra surprise" - "Living A Boy's Adventure Tale" (Demo) (5:10). The disc is of similar design to the book featuring the three monkies. The CD has a white rim on which the track list has been printed. Early pressings of the CD have Paul's surname spelt incorrectly as "Waktaar-Savoy", this was later corrected. This book was translated into English and sold via www.a-ha.com from November 2004(?). Although similar to the Norwegian version, there are some differences in the text and pictures. Also, the title is printed as "The Swing Of Things Twenty Years With a-ha" on the spine and it doesn't have a sticker on the front cover. The English book comes with the same demo CD (complete with the Waktar spelling mistake).